There aren't many indigenous local D.C. dishes, but there is one concoction the locals proudly claim as their own: Mumbo Sauce. Washington D.C., is the nation's most international city populated by long term locals and many many imports. Much of the local population comes and goes with the political tides. According to the Washington Post, only 15 percent of the white population was born in D.C., while only 60 percent of the black population was born there. As a result, there aren't many indigenous local dishes, but there is one concoction the locals proudly claim as their own: Mumbo Sauce. Theresa Vargas, in an article in the Washington Post in July 2011, wrote "The Italians may have their marinara and the French their bearnaise, but for many D.C. natives, the sauce that captures the flavor of home is called mumbo. Few can tell you how it's made or where it originated, but they know this: If you grew up in one of the mostly African American areas of the city, you've likely known the taste your entire life. If you didn't, you probably have no idea what it is." It is so popular there is even a band named Mumbo Sauce, and another group, Soulful, has an album named Mumbo Sauce (that's the cover below). Many D.C. area restaurants, especially Chinese restaurants, Korean restaurants and fried chicken carryouts serve Mumbo Sauce, which is sometimes also called Mambo Sauce, Mombo Sauce, Mumba Sauce, Mumble Sauce and even Mummbah Sauce. Drive through the Petworth neighborhood and there are scores of restaurants that offer Chinese Carryout, Fried Chicken and Pizza all in one storefront, and they all have Mumbo Sauce. You'll also find it in Chinatown. Mumbo Sauce is different from place to place. It ranges in color from orange to red, it is thinner than the typical red barbecue sauce, and it usually tastes closer to Chinese sweet and sour sauce. In fact, sometimes I wonder if it is simply sweet and sour sauce with a little ketchup added. Both red barbecue sauce and sweet sour sauce are typically made with the same base: tomato concentrate, distilled white vinegar and sugar. The red stuff plays the lead in typical American red barbecue sauces, with the vinegar and sugar playing second fiddle. In Mumbo sauce the tomato base plays bass in the background with the vinegar and sugar playing the lead. 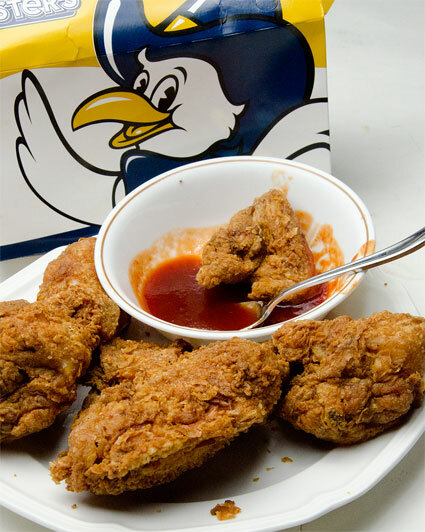 Mumbo sauce is most popular on chicken wings, but it works on just about anything deep fried. That may sound odd, but remember, in the Deep South, fried chicken and fish are often served with honey. I've always found honey to be a bit cloying, but the vinegar in Mumbo Sauce is a great knife for cutting through fried foods. 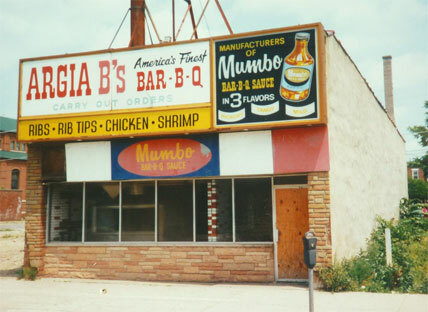 Long time residents argue about where Mumbo Sauce originated, making claims that it first appeared sometime in the late 1950s or early 1960s at either Wings 'N Things, U Street or Johnny Boy's, among others. I did some digging and the trail led to Charlene Archie who declares with certainty it was invented at Wings 'N Things on 7th and Florida Ave NW near Howard University. She recalls that it was run by African Americans although it may have been Chinese owned, and, now defunct, it made its run from about 1962 through 1978. She says the original was the best by far and she has never tasted anything close. Well, I hate to break it to you D.C., but the original Mumbo Sauce was probably a ketchupy barbecue sauce created in Chicago in 1957 by Argia B. Collins, Sr.
An African-American from Indianola, Miss., Collins was part of the great post WWII migration to the industrial north from the agricultural south, especially from the Delta area of Northwest Mississippi. Collins opened his first barbecue joint, Argia B's Bar-B-Q, in the early 1950s in a storefront on the South Side at Forrestville and 47th St., and in 1957 he created his signature Argia B. 's Mumbo Bar-B-Que Sauce. His daughter, Allison Collins, says "In addition to great ribs, my Dad sold hot links, fried chicken, fish, shrimp and fries, all of it drenched in Mumbo Sauce." In this picture from his daughter you can see the prominence he gave Mumbo Sauce in his signage. His sauce's popularity helped him and his brothers open about 10 other storefronts. They are all long gone, and Argia B. is gone too. He died in 2003, but, according to his obit in the Chicago Tribune, "He also provided the fuel, quite literally, to the civil rights struggle of the 1960s, as his popular barbecue restaurant was a frequent source of free nourishment for a young Rev. Jesse Jackson and other organizers of Operation Breadbasket, a predecessor of Operation PUSH." Argia B. may be gone, but his sauce lives on, made under the guidance of his daughter, and it can be found around the Midwest, especially in Jewel-Osco grocery stores and Wal-Marts. Collins' Mumbo Sauce can also be ordered online. How did Chicago Mumbo Sauce make its way into Chinese restaurants and fried chicken joints in D.C.? We can only speculate. The South Side of Chicago has vast concentrations of African-Americans, but it is also the home of Chinatown, which, in the '50s, bumped right up against the area known as Bronzeville to the East, a center of black entrepreneurship. Bronzeville was either home or home away from home for familiar: Lorraine Hansberry, Louis Armstrong, Muddy Waters, Willie Dixon and Buddy Guy, most of them migrants from the South, like Argia B. Just north of Chinatown was the Maxwell Street open air market, originally a Jewish enclave that after WWII morphed into a center of black commerce. It was the location of the memorable restaurant scene from the Blues Brothers movie with Aretha Franklin singing "R-E-S-P-E-C-T."
It is not hard to imagine that an African-American bought a bottle of Mumbo Sauce from his favorite ribjoint and later used it on carryout eggrolls from Chinatown. It is not much of a stretch to imagine that he or she moved to D.C. and brought Mumbo Sauce along. Perhaps it got there in the suitcase of one of the great South Side bluesmen. Perhaps it made the transit with an African-American cook from a Chinese restaurant. Or perhaps the vector was even a Chinese cook moving from Chicago to D.C.. However Mumbo journeyed from Chicago to D.C., within a decade after Argia B. introduced his signature condiment, something bearing the same name began appearing in D.C.. Since there is no official recipe, since it varies significantly from joint to joint, I've created one that has the best features of my faves. Try it on fried chicken, fish or shrimp, or even on eggrolls. Unorthodox as it may sound, it's pretty good on barbecue ribs and pulled pork, too. Preparation and cooking time: Less than an hour even if the kids are in your hair. About the tomato paste: some places use ketchup, I much prefer it with tomato paste. About the hot sauce: I use good old fashioned Tabasco Sauce, but you can use Sriracha or whatever you like. This small amount gives it a mild background heat. Taste it and add more if you wish. I am not into really hot sauces, but I usually use 1/2 teaspoon in theis recipe. About the pineapple juice: You can swap orange juice for the pineapple juice if you like, but I prefer it with pineapple juice. About the vinegar: You may be tempted to use cider vinegar or something with more flavor, but resist the temptation. Plain old clear distilled vinegar is the right call for this sauce. Mix all the ingredients in a pot. Simmer, but do not boil, for about 20 minutes to marry the flavors and thicken it a bit. Taste and adjust to your preferences. Like it hotter, be my guest. You can drizzle it on the food or serve it in a bowl for dipping. Or both. Toss it in the microwave for 20 seconds or so first to take the chill off. Mumbo Sauce can be refrigerated for months. Capital City Mumbo Sauce made by Arsha Jones in her Annapolis, Md. home, and you can order it from her website, just click my link. Chuck's Wagon BBQ, on Main St. in Upper Marlboro, Md. Some restaurants sell it by the bottle on premises, among my favorites, Smokey's at 4714 14th St. NW, Washington D.C. 20011 in Petworth. She calls hers Mambo Sauce. If you've had Mumbo Sauce, who makes your fave? All text and photos are Copyright (c) 2012 By Meathead, and all rights are reserved. For more of Meathead's writing, photos, recipes, and barbecue info please visit his website AmazingRibs.com and subscribe to his email newsletter, Smoke Signals.